It is possible that the main title of the report Froelich’s Syndrome is not the name you expected. Please check the synonyms listing to find the alternate name(s) and disorder subdivision(s) covered by this report. Froehlich syndrome is a constellation of endocrine abnormalities believed to result from damage to the hypothalamus, a part of the brain where certain functions such as sleep cycles and body temperature are regulated. Froehlich syndrome appears to be acquired while certain other disorders that resemble it, such as Prader-Willi syndrome, are genetic. This syndrome appears to affect males mostly. The more obvious and frequently encountered characteristics are delayed puberty, small testes, and obesity. Teen-age boys with this disorder must be distinguished from those who have inherited growth delay disorders or Prader Willi syndrome. Other symptoms of the syndrome may include excessive thirst (polydipsia), excessive urination (polyuria), and very delicate skin. Froehlich syndrome is usually the result of lesions in the hypothalamic gland, the endocrine gland that produces substances that stimulate the pituitary and regulate the appetite. In some cases of Froehlich syndrome, the front portion (anterior) of the pituitary gland fails to secrete the hormones that are necessary for the onset of normal puberty. A diseased area (lesion) in the hypothalamus or pituitary is the usual cause of the syndrome. A tumor of the pituitary that is frequently the cause of damage to the hypothalamus in children and adolescents is an expanding hollow (cystic) lesion (craniopharyngioma). Inflammation from an infection such as tuberculosis or an acute inflammation of the brain (encephalitis) are other injuries that may be responsible for the lesion and, hence, the condition. Froehlich syndrome is a very rare condition that affects more males than females. Bardet-Biedl Syndrome is a rare disorder affecting many systems in the body. It is inherited as an autosomal recessive genetic trait. The major symptoms of this disorder may include mental retardation, obesity, delayed sexual development, underdeveloped reproductive organs, degeneration of the retina of the eyes, kidney abnormalities, and/or abnormal fingers or toes. This disorder affects males and females in equal numbers. Borjeson Syndrome is a rare disorder thought to be inherited as an X- linked dominant genetic trait with less severe symptoms in females. Major characteristics of this disorder may include an unusual facial appearance, mental retardation, seizures, short stature, slowed sexual development, muscle weakness and/or obesity. Hypogonadotropic hypogonadism (secondary hypogonadism) is a disorder that effects the development of the region of the hypothalamus that regulates the production of hormones which stimulate the ovaries or testes (gonadotropins). People with this disorder have reduced levels of hormone secretion, and experience a delay in the development or absence of secondary sexual characteristics. Laboratory analysis of the urine from children with Froehlich syndrome typically reveals low levels of pituitary hormones, and that finding may suggest the presence of a lesion on the pituitary. 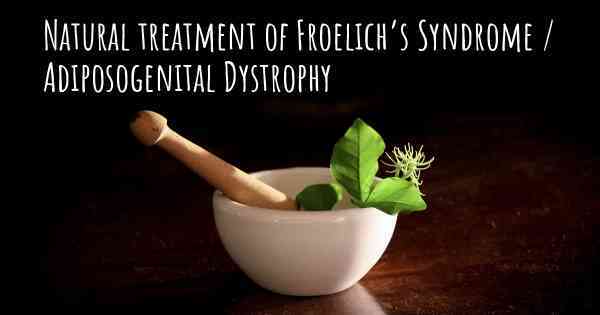 Additional tests are needed before a definite diagnosis of Froehlich syndrome may be made. Diagnosis of Froelich syndrome may be difficult and requires cautious and thoughtful clinical examination, testing urine for low levels of pituitary hormones, and likely other additional tests before a definitive diagnosis of Froehlich syndrome can be made. Pituitary extracts may be administered to replace the missing hormones (hormonal replacement therapy) in patients with Froehlich syndrome. Tumors of the hypothalamus should be surgically removed if possible. Appetite may be very difficult to manage, although weight control depends on this.